Known as matki in Maharashtra, the lentil variety used in this dish is best understood as moth (sounds as in ‘moat’ but with a heavy accent on ‘t’ and not the same as the insect moth) beans or dew beans. Matki is mostly steamed or sprouted and used in salads and snacks. However, I use it mostly to make it in a gravy similar to rajma (kidney beans). Matki has a creamy texture and cooks quickly which makes it ideal for dal maakhani, but without the makkhan or butter. Roast the beans till slightly warm. Soak for an hour and boil under pressure till very soft. I gave it 5 whistles and cooked in sim for 15 minutes. The beans is cooked when the skin should burst open on cooking, and the beans should become really tender. Matki | Moth beans – 1 and 1/2 cups. Cashew / Magaz (Melon seeds) thick paste – 2 tbsp. Temper the dal with jeera as I did but it tastes and smells better when you add some curry leaves, dry red chillies and ginger sticks with the jeera. My kids were already singing for their supper so I just had to leave out these! Roast beans till warm. Soak for an hour. Discard water and cook under pressure in fresh water for five whistles. Reduce fire to sim and cook further upto 15 minutes. Set the cooker aside to cool naturally. Heat oil in a heavy wok or kadhai. Add garlic, ginger and onions, and fry till onions turn light brown. Add the tomato puree and fry stirring occasionally till juices dry. Add the salt, turmeric and chilli powder powders and mix. Add the cooked beans along with liquid if any. Add the melon seeds-cashew paste and mix well. You can avoid this and the dal will still be creamy, but this paste helps round off any sharpness. Add hot water to thin to a flowing custard consistency. Bring to a boil and remove from fire. Heat a teaspoon of oil, crackle jeera, dry red chillies and curry leaves (optional). Pour over the dal. Garnish with roughly chopped coriander leaves and serve hot with rice or roti. Note – The number of tomatoes depend on how thick or thin you would like the gravy to be and on how sour they are. If the tomatoes are very sour, reduce the quantity and slightly increase the melon seeds-cashew paste. If less sour, balance with a pinch of amchoor (dry mango powder) or anardana powder (dry pomegranate powder). Tried this recently and it was super delicious. Also a great change from the usual goda masala/usal masala type maharashtrian preparations that I use for matki. The cashews add SUCH a creamy touch! Thanks a lot, I hope to make it again while good tomatoes are around. This way of cooking moth is new to me. Moth and makhni, lovely. I don’t use cream in gravy dishes and use whipped thick yogurt instead. Vani – I think if you would really like to keep the fat quotient minimum and the rich taste make it a totally magaz(melon seeds) paste! Sharmila – I am ‘Confuscious’ now! Cham – Yes, I was looking for the word chirru payir! Jayasree – Glad you like it:) Do try it – it is very pleasant! Rachel – Thank U so much, you’re a dear! 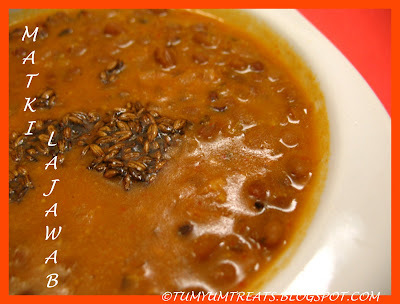 Makhani with matki….very interesting…I usually make usal using goda masala….btw, matki is called dew beans in english. Loved your makhani as an alternative to the urad one. Let me try to get the chinna payar at my near by store. Matki usal was fav bhaji in the tiffin…..’Moth bean’ is the closet i know for its english name.